Sundays are a great day to relax and enjoy a good read. One of my favorite vestment books is an old classic on the topic of Liturgical Sewing. Like many books in my vast library on the topic of vestment making, Ecclesiastical Embroidery and the making of church linens, the book of choice for this evening is, well, vintage, if a book can be called that. Or perhaps classic might be a better term. However one looks at it, the book on my work table this evening (at least one of them) is old! This book is written with the primary idea of promoting a more reverently industrious spirit among the people of our parishes. Incidentally the making of Vestments by the women of the parish saves a great deal of needless expense; but it also brings all those who assist in such work into closer touch with the Church, her meaning,s and her blessed privileges. 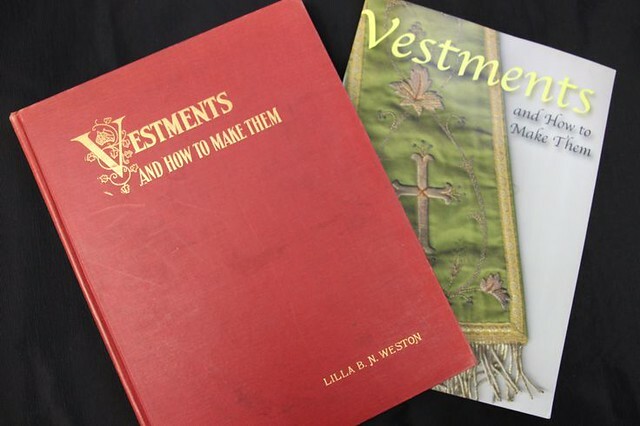 The book covers topics on many common vestments such as the Chasuble, dalmatic, church linens, and stoles. 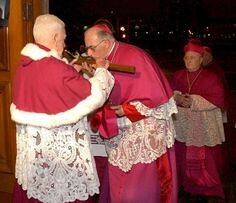 But what about some of the not so common vestments such as the mozetta* and chimere**? Well, this is one of the few books that at least touch on the subject of the rare and not so common vestments, too. The book provides a nice history of many vestments at the beginning of the text, explaining how garments went from being the common dress in many cases of a Roman citizen, to becoming attire for liturgical use. While the book does have patterns and instructions for making vestments, by today’s standards, the it is not a “cookbook” method, meaning much is left to understanding and assumed knowledge. There are no detailed step by step instructions. Even as one trained in pattern making and costume design, I freely admit there is more than one area that has given me pause to stop and contemplate what is missing in detail. Now, what is the reason for two books of the same title on my shelf? This timeless treasure is long out of print, and is being reprinted made available today on such sites as Amazon in a soft cover version. The reprint is nice, but the text size is small, which makes work on patterns a challenge. 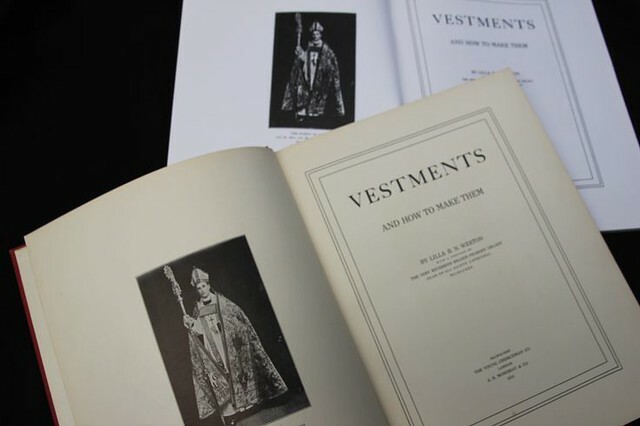 Fortunately, I was able to find an original hard cover copy of Vestments and How to Make Them. And it is a treasure, as are many of the original volumes in my library. The original hard covered book still has clearly visible black and white photos, and the text size is legible. But knowing how scarce original copies are, the paperback available from Amazon and other sources is very nice. As in all things, this title is very useful, but I never rely solely on one resource when it comes to making vestments. I always review several sources, including my now favorite French, German and Dutch titles for background information, illustrations of designs, and to verify consistency of information before undertaking the making of any vestment pattern or ecclesiastical sewing project. Sometimes there is an added bonus when multiple sources are reviewed. It often broadens to scope of design possibilities. One examples is the French and Dutch vestment books have some lovely and unique stole patterns and designs that I am looking forward to giving a try! I will be sure to keep you posted on the outcome. So, what is your favorite title on the subject of vestments and vestment making? *Mozetta. 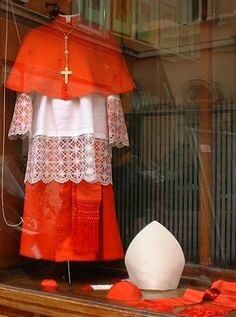 a short cape that covers the shoulders and can be buttoned over the breast, and to which a hood is attached, worn by the pope and by cardinals, bishops, abbots, and other dignitaries. **Chimere. a garment worn by Anglican bishops in choir dress, and, formally as part of academic dress. A descendant of a riding cloak, the chimere resembles an academic gown but without sleeves, and is usually made of scarlet or black cloth. Weston, L. (1914). Vestments and How to Make Them. London. A. R. Mowbray. I stumbled across your site searching online for chimere sewing patterns. I have recently been made a verger at St Luke’s Episcopal Church in Salisbury, NC. As vergers we supply our own cassocks and cinctures. Our chimeres were made by a sewing guild at a local Hispanic congregation, using a pattern that we had. That sewing guild and congregation have “closed” and our pattern has disappeared. The pattern was originally purchased from the Verger’s Guild of the Episcopal Church, but they have stopped selling the pattern as they now sell vestments made by CM Almy. Do you know where one could get a sewing patter for a verger’s chimere? There are some new vergers and us new folks would like to have our own made instead of always have to borrow some. We have the seamstresses, jut not the pattern. Thanks in advance for any guidance you could provide.